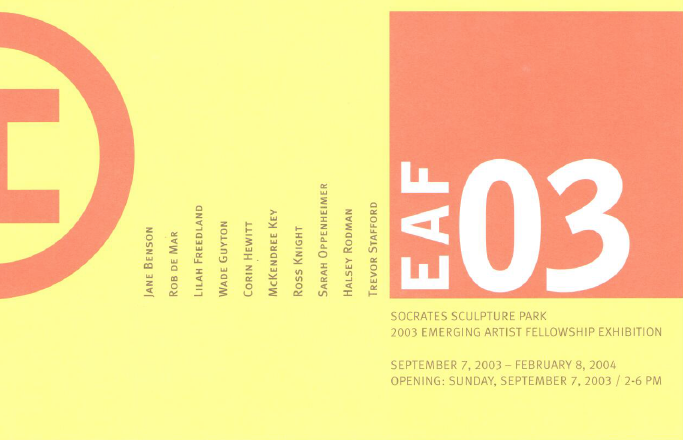 Socrates Sculpture Park is pleased to announce the opening of EAF03: The 2003 Emerging Artist Fellowship Exhibition, featuring works by Jane Benson, Karlos Carcamo, Rob de Mar, Lilah Freedland, Wade Guyton, Corin Hewitt, McKendree Key, Sarah Oppenheimer, Halsey Rodman, and Trevor Stafford. Through the Emerging Artist Fellowship Program, Socrates Sculpture Park gives young artists the opportunity to pursue open artistic exploration and to create public works on a scale that would otherwise be impossible to realize, especially within the confines of New York City’s limited affordable studio space. The program offers an important chance to expand both the scale and the scope of ideas that they have developed in their earlier work, to experiment with new materials, and learn about the challenges and requirements of outdoor sculpture. Fellowship recipients are awarded a financial grant, a residency in the outdoor studio, access to the space, facilities, materials, and technical assistance to create new works, and administrative support to fundraise for their projects and pursue future commissions, residencies and placement for their work. 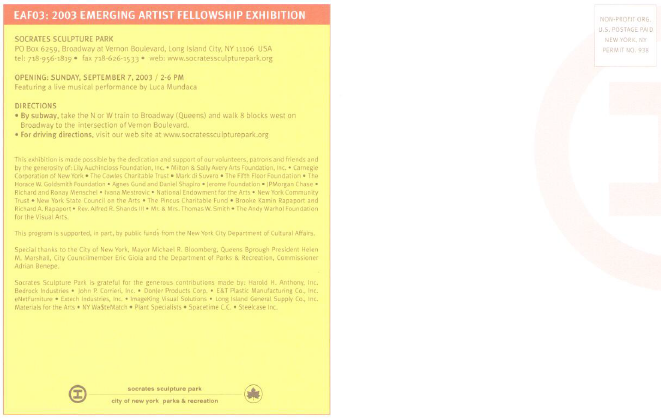 A component of the Park’s expanded Exhibition Program, the annual Emerging Artist Fellowship Exhibition was inaugurated in the 2001 season. In the past, the Fellows’ works were included in one of two large thematic group exhibitions during the year. With the restructuring of the Exhibition Program, the fellowship exhibition has become its own annual show, better showcasing the individual talents of these younger artists. For over seventeen years, Socrates Sculpture Park has been committed to giving emerging artists a chance to work outside the confines of a traditional studio environment in a community that is supportive and encouraging, and to follow new directions in their work, realize ambitious projects, and exhibit in an open, professional forum. The Park is a laboratory where experimentation and innovation expand, reinvent and redefine the tradition of art in public spaces. The opening reception will feature a performance by Brazilian singer songwriter Luca Mundaca and her band. From pop to jazz to Brazilian indigenous forms, Luca’s mesmerizing vocals and sultry guitar rhythms exude the energy, joy and warmth of Brazil with the sounds of samba, bossa nova, baiÃ, jazz and pop. This exhibition is made possible by the dedication and support of our volunteers, patrons and friends and by the generosity of: Lily Auchincloss Foundation, Inc.; Milton & Sally Avery Arts Foundation, Inc.; Carnegie Corporation of New York; The Cowles Charitable Trust; Mark di Suvero; The Fifth Floor Foundation; Agnes Gund and Daniel Shapiro; Jerome Foundation; JPMorgan Chase; Richard and Ronay Menschel; Ivana Mestrovic; National Endowment for the Arts; New York Community Trust; New York State Council on the Arts; The Pincus Charitable Fund; Brooke Kamin Rapaport and Richard A. Rapaport; Rev. Alfred R. Shands III; Mr. & Mrs. Thomas W. Smith; The Andy Warhol Foundation for the Visual Arts. This program is supported, in part, by public funds from the New York City Department of Cultural Affairs. Special thanks to the City of New York, Mayor Michael R. Bloomberg, Queens Borough President Helen M. Marshall, City Councilmember Eric Gioia and the Department of Parks & Recreation, Commissioner Adrian Benepe. Socrates Sculpture Park is grateful for the generous contributions made by: Harold H. Anthony, Inc.; Bedrock Industries; John P. Corrieri, Inc.; DonJer Products Corp.; E&T Plastic Manufacturing Co., Inc.; eNet Furniture; Ex-Tech Industries, Inc.; ImageKing Visual Solutions; Long Island General Supply Co., Inc.; Materials for the Arts; NY Wa$teMatch; Plant Specialists; Spacetime C.C. ; Steelcase Inc.